Many individuals suffering from eating disorders such as anorexia, bulimia and binge eating disorder find great value in attending support groups. The recovery from an eating disorder is often a very long and winding road, and relapses in which an individual falls back into old food behaviours and patterns are fairly common, especially at the start of a recovery. Knowing that there is a non-judgemental place to air one’s feelings and where everyone will be supportive and understanding (and very often not a part of one’s everyday community), often gives the individual a sense of security and the strength to continue on. 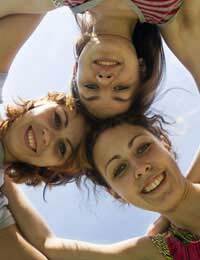 Support groups for individuals suffering from eating disorders can take a wide variety of formats. Some groups operate for specific eating disorders, such as specifically for those who suffer from anorexia or bulimia, while others embrace a wide variety of eating disorders and operate a more “all comers” attitude towards members. Some groups choose to divide along gender or age lines, for example operating specifically for teen girls, while others make no such distinctions. The frequency of group meetings may differ from a few times a week to once a month or so, and the actual agenda of the group – how members contribute, if all members must contribute, etc. – will vary as well. One thing that almost all eating disorder support groups have in common, however, is the presence of a moderator. The moderator is usually a qualified professional with experience in the eating disorder field, such as a psychologist or social worker, and is in charge of keeping the group on topic and functioning effectively. Eating disorder support groups often operate at hospitals or clinics, via private mental health professionals’ offices and in church, school or community halls. Inquiring at a GP’s office or a local hospital will often yield information on local support groups, as will asking at local colleges or universities. Many websites offer information on eating disorder support groups in the UK, with some offering a Help Finder section to help you find UK based groups. Unfortunately, not every community has accessible support groups for individuals suffering from eating disorders. Anorexics, bulimics or binge eaters who find themselves without the option of attending support groups may be able to find some degree of support online. You'll find many resources, such as message borads and chat rooms for those suffering eating disorders as well as a variety of online support including ICQ and AIM lists. These groups may not be moderated by a professional, or monitored by anyone at all for that matter, and registration may be required. Many individuals suffering from eating disorders attend support groups so that they have somewhere to go where they can discuss their behaviours, emotions, difficulties and worries without judgement. Such groups also provide the support of those who have experienced similar situations, and very often relative anonymity as other members of the group are not necessarily a part of the individuals’ lives in any other way. The safety and security that individuals suffering from eating disorders experience in these support groups often goes a long way towards successful recoveries. @dean1974 - The Hampshire wide Eating Disorders Service forms part of Southern Health NHS Foundation Trust and is run from bases in Southampton, Basingstoke and Portsmouth. It provides assessment and treatment for people with eating disorders including anorexia nervosa, bulimia nervosa, binge eating and some atypical eating disorders. Your friend can contact her GP to request a referral. Please see link here. I hope this helps. Hi, I currently have a client that is suffering from an eating disorder and am trying to find a local support group in the Hampshire area that they can attend, preferably in the Southampton or Portsmouth area. Any suggestions?